Pink diamond 100% Kanekalon braiding Hair & Color m1b - burg. 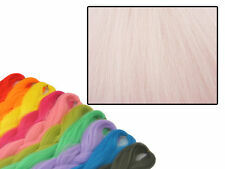 Lace Insets: Allows the wearer to part the wig and brush the strands in any direction. Tangle and Frizzle Free: Wig can be styled with human hair combs. Stylable with Heat Based Tools: Heat Resistance of 170 Degrees Celsius which will allow styling with heat based tools such as Straighteners, Curling Irons, and Blow Dryers. This hair is also perfect for crochet dreads. We are world renowned for our gorgeous range of mouth watering creations from our huge collection of custom made Cyberlox to our stunning handcrafted DE wool roving dreads, which are perfect for installing in you your own hair and most recently for our epic and sought after Phantasia range of jumbo braid which has rocked the dreads world - which is available in 136 different colours - the perfect hair for ALL of your dread making needs! Catface Hair Ombre Kanekelon Jumbo Braiding Hair Extensions. The hair is Kanekelon, 100% synthetic. It has been carefully dyed to achieve the most beautiful and flattering colour. You can fold it and cut it twice for bobs and shorter lengths. 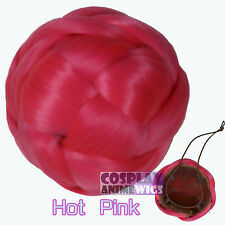 Hot water Braids - Pink. Length: 40".